Dynamic Filtration In whole body measurements, the tissue thickness varies over a wide range within the scan. Fingers are typically only 1 cm thick, while the abdomen may be 30 cm or more. 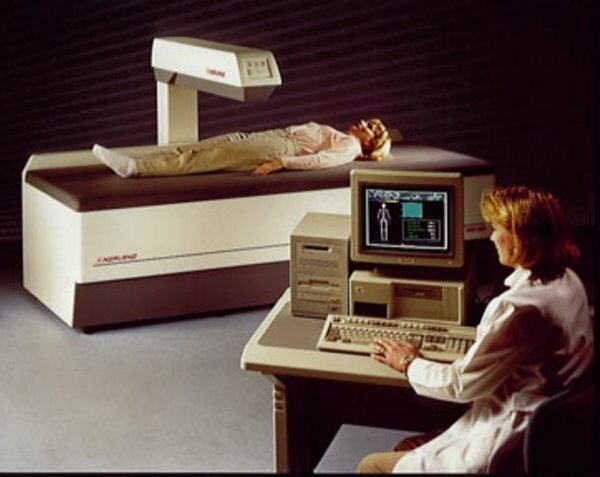 For DXA measurements, there is an optimal x-ray beam intensity for each patient thickness. Therefore, scanning the whole body at a fixed intensity guarantees that many pixels will be measured at a signal-to-noise ratio which is either too low or too high. If the intensity is too low, poor precision due to counting statistics will result. With the conventional (fixed intensity) technique used by some manufacturers, precision becomes steadily worse with increasing body thickness. If the intensity is too high, the detector may become saturated and poor accuracy will result. Norland's XR-36 advances the technology of total body DXA scanning by introducing DYNAMIC FILTRATION. Unique to DXA, this new scanner technology compensates for the wide range in tissue thichness by varying the x-ray beam intensity during the course of a scan. This assures each pixel will receive the proper exposure regardless of tissue thickness. Filters are changed within a single pixel acquisition with no loss of data. This type of automatic exposure control is common in general radiography, but Norland is the only DXA manufacturer using this technology. Tests were run on the Norland Whole Body Phantom which show excellent linearity and precision over a large range of subject thicknesses1. Norland's Dynamic Filtration system covers a 250:1 range of x-ray intensities so you are assured of optimum performance with any size patient. This automatic exposure control provides the best precision possible while minimizing dose to smaller patients.